Custom Logo Leather Golf Scorecard Holder. Made from durahide leather. Keeps your score card from getting damaged or soiled while on the course. Imprinted with your Logo for your next Golf Tournament or Event. Lifetime Guarantee. 4 1/4 Inches W x 5 3/4 In..
Keep your scorecard out of the elements with this golf scorecard holder. Holds a golf scorecard neatly in place, Elastic pencil loop. 4.25"L 0.25"W 7"H..
4-color Logo Leather Yardage Cover - Golf Tournament Gifts..
4-color Logo Tri-Fold Leather Golf Scorecard Holder - Golf Tournament Gifts.. Custom Bi-Fold Leather Golf Scorecard Holder - Golf Tournament Gifts.. Custom Leather Golf Scorecard Holder - Golf Tournament Gifts.. Custom Leather Yardage cover - Golf Tournament Gifts.. 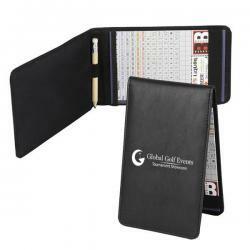 Custom Logo Economic Golf Score Card Holders with Retractable Pencil Holder, clips onto Golf Bag. You'll never lose another pencil or score card. Make great gifts for your next golf tournament. ..
Embossed Golf Scorecard Cases - Golf Tournament Gifts..
Wholesale Nylon Golf Scorecard Holder - Golf Tournament Gifts.. Premium Golf Score Card Holder - Golf Tournament Gifts..